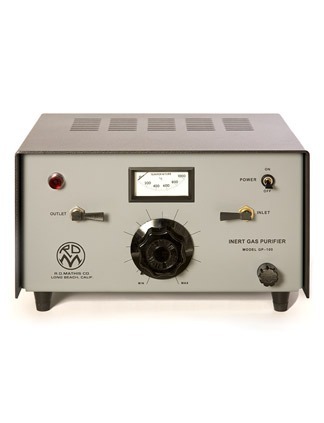 Our “GP100” model gas purifier has been designed to fill the needs of research and development engineers and scientists as well as production staff to provide a lightweight, compact, low cost inert gas purification system. This unit operates off of standard cylinder gas to purify inert gases to ultra high purity levels and avoids the problem of cylinder walls outgassing during storage. This unit can be placed in operation in less than 1 hour, simply by connecting the inlet and outlet fittings and 110vac (or 220vac) electrical connection. The “GP100” has been shown to purify 99.8% argon gas to 99.9991% purity as part of a worst case test. Available literature indicates that starting with a high purity gas and using all stainless steel fittings, impurity levels as low as 10-8 p.p.m. in oxygen can be obtained. While the unit was designed primarily for argon gas, it may be used for helium, xenon and neon. Applications for the unit include purification of gases for sputtering modules, crystal growth furnaces and glove boxes. A paper on “The Purification of Inert Gases”, discussing a variety of inert gases is available upon request.